This recipe for carrot slaw is not only easy to make, but goes with just about anything and everything you’ve got in mind for your 4th of July picnic. It will even sit well right next to your homemade Potato Salad! You could even toss in a pinch of cayenne pepper to create some fireworks at the picnic table! In a medium bowl combine garlic, white wine vinegar, Herbes de Provence, honey, grapeseed oil, salt, pepper and cayenne, if using.—Stir to combine. 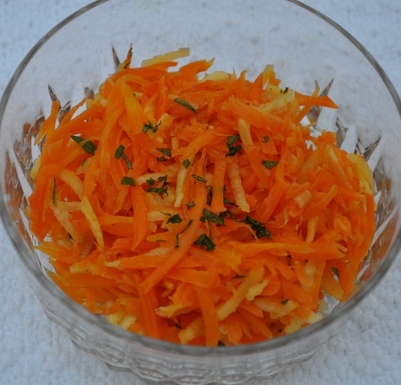 Add the shredded carrots and toss. Sprinkle chives on top for color and garnish.